Features: High intensity 2000 Watt light. Adjustable flood and spot setting. Application: Good for lighting medium sized venues and used as fill lighting for larger areas. Good for stage performances, churches and weddings. 2K Lights for Hire from Cam-A-Lot Rentals. When you need a lot of light! go for our 2k option at a high intensity of 2000 watts. We have the blonde for use on a light stand. There is also a Desisti which is better suited to hanging from studio roof trussing. They are tungsten colour balanced and adjustable from spot to flood. We have other lighting option available which you can view here. 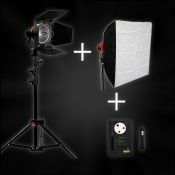 There is also a selection of photographic lighting available for hire. Don’t forget to like us on our Facebook page and see our latest news.